I recently had the distinct pleasure of reading “Hound Dog,” the autobiography of Jerry Leiber and Mike Stoller. They were the first great record makers of rock and roll, although they themselves said all they ever wanted to do was make good rhythm and blues. So our Song of The Week is naturally going to be one of my favorites of their many, many, many hits. I hope you’ll bear with me if a take a somewhat circuitous route in getting to it. Know what a shaggy dog story is? “An extremely long-winded tale featuring extensive narration of typically irrelevant incidents, usually resulting in a pointless or absurd punchline.” Well, that’s me to a T. But maybe you’ll find some of those incidents surrounding Leiber and Stoller as interesting as I do. If not, I won’t be hurt. Just click on the links and enjoy their very fine music. 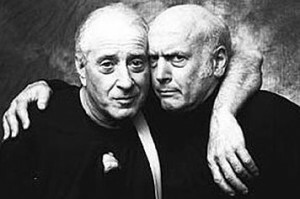 Jerry Leiber and Mike Stoller were both born in 1933. Stoller grew up in a wealthy Jewish home in NY. His first exposure to black music was at an integrated sleep-away camp in 1941(! ), where Paul Robeson was a guest artist singing spirituals and Hebrew folksongs. Stoller heard a black kid playing boogie-woogie in barn, which he says changed his life. Back home, he took piano lessons with James P. Johnson (1894-1955), king of the stride piano, composer of “The Charleston”, mentor of Fats Waller, compadre of Willie ‘The Lion’ Smith and Bessie Smith. In his early teens, Stoller fell under the spell of Charlie Parker and Thelonious Monk, the luminaries of bebop. 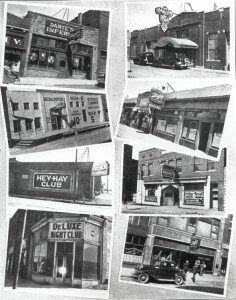 Leiber grew up in poor Baltimore, fought in street gangs, blacks and black music an integral part of the social landscape. He says that his musical revelation was as a kid washing dishes in an all-night diner, he watched the short-order cook leaning back with a joint hanging out of his mouth, listening to Jimmy Witherspoon’s “Ain’t Nobody’s Business“. Leiber and Stoller met up in 1950 in LA, two 17-year old Jewish boys bubbling with enthusiasm for R&B. In 1951 they managed to get a few songs recorded for some ‘minor labels with major talents’, including even the young Ray Charles. 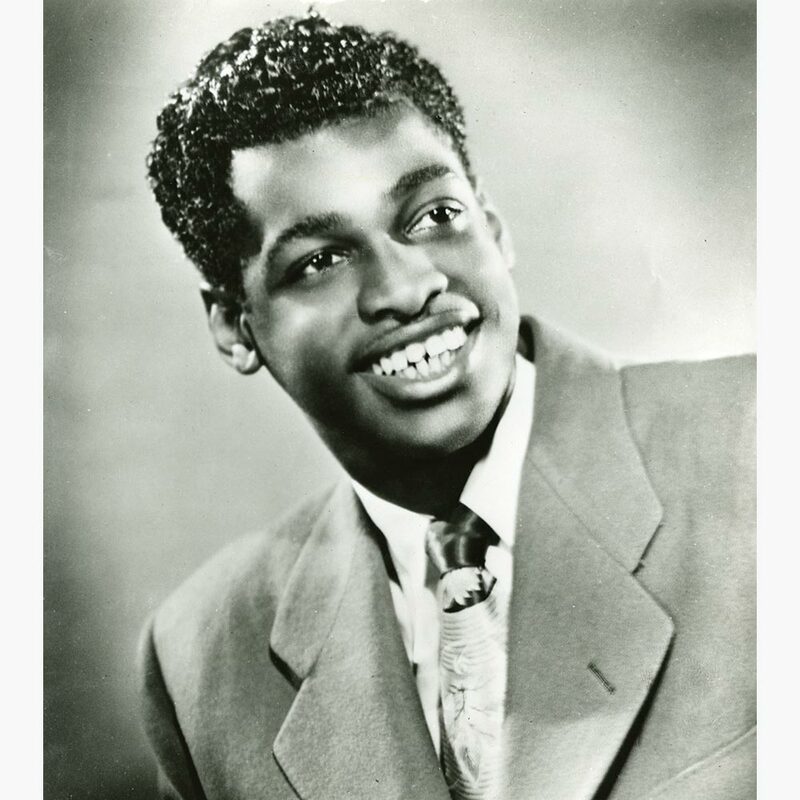 In 1952 they wrote “Kansas City” for Little Willie Littlefield, which became a hit for Wilbert Harrison in 1959, and was eventually recorded by some 300 artists including The Beatles. One morning they got a call from guitarist/producer Johnny Otis. He was in his garage rehearsing with Willie Mae “Big Mama” Thornton. He needed a song for her. Our boys wrote it in minutes, and drove over to Otis’s garage. There they met Ms. Thornton attired in her combat boots and oversized overalls. Mike played the song on the piano, and she began to croon it. “Come here, boy,” she said, motioning me to stand even closer to her. “I’ll tell you what you can attack. Attack this…” she added, pointing to her crotch. Johnny Otis came to the rescue, saying “You sing it Jerry, you show Big Mama how it goes.” This is the result. Leiber and Stoller were paid $1200 for the song, but the check bounced. Released in 1953, it did fairly well by R&B’s modest commercial standards, but within one month 5 more versions had been recorded. In the mid-50s, white kids were beginning to become attracted to the dangerous sexuality of black rhythm and blues – but it was a bit too raw and threatening, so they greatly preferred to buy white versions of black music. 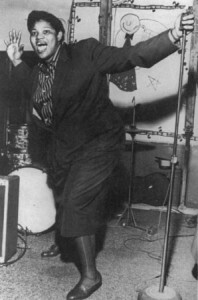 The first commercially successful rock and roll songs were Bill Haley’s 1954 sanitized cover of Big Joe Turner’s “Shake Rattle and Roll”, and “Rock Around the Clock” in 1955. There were lots of clones and imitators of Bill Haley, including a long-forgotten Freddie Bell and the Bellboys. 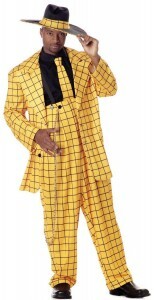 They were having a successful run in Las Vegas, and one of their popular numbers was a jokey, novelty version of Big Mama’s “Hound Dog”. Elvis Presley and his band were having an unsuccessful run in Vegas at the same time. They watched Freddy Bell nightly. Elvis liked the song, decided to try it himself. 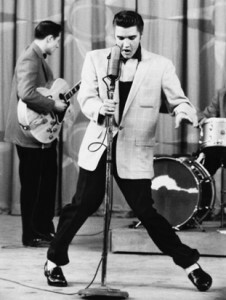 When he appeared with it on Milton Berle’s TV show, over 40,000,000 people saw the performance, and the network received thousands of letters of complaint about how ‘Elvis the Pelvis’ was promoting juvenile delinquency. I guess that’s when life as we’ve known it in the second half of the twentieth century really started. 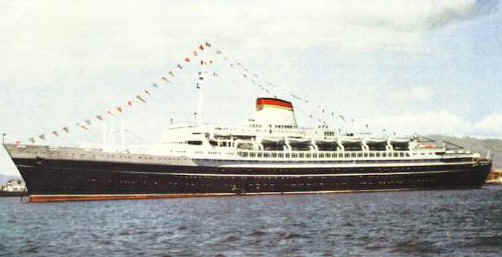 In 1956, Stoller was honeymooning in Paris. 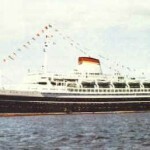 He and his bride were returning to New York on the luxury liner the S.S. Andrea Doria. It collided with another ship and 46 passengers died. Stoller and his wife made it into lifeboats. Although Leiber and Stoller had great respect for Elvis as a performer, they never really liked what he did to the song. 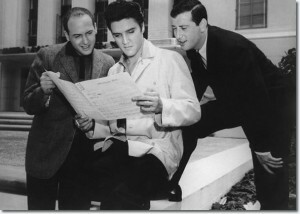 They eventually became the main source of music for his movies, writing dozens of songs which Elvis recorded, including “Love Me,” “Loving You,” “Don’t,” and “Jailhouse Rock.” For a while they were becoming quite friendly with Elvis, but Colonel Parker didn’t like those Jewish boys hanging around his golden rooster and kept them away. Meanwhile, back at the ranch, Leiber and Stoller had met up with Nesuhi and Ahmet Ertugun, sons of the Turkish ambassador to the US, great jazz and R&B fans, owners of Atlantic Records. 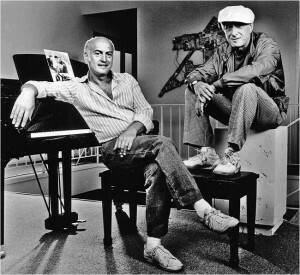 Leiber and Stoller started grinding out major hits for Atlantic for a group called The Robins, which soon morphed into The Coasters. They used The Coasters to paint aural pictures, their own very wonderful version of comic-book blues. These hits left an indelible mark on popular music for two reasons. First, because as L&S said, “We didn’t write songs; we wrote records.” They wrote not just the song, but also the arrangement, the style, the sound, the nuances of the vocal performances, the entire production. And in that, they were the first real creative artists in the popular idiom. 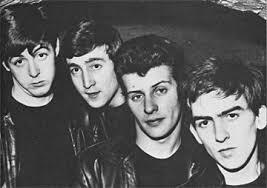 In that, they predated the Brill Building songwriters, not to mention The Beatles and Dylan and the generations of music makers they inspired. Oh, yeah, and secondly—well, just listen to how great these hits are: “Riot in Cell Block #9”, “Smokey Joe’s Café”, “Down in Mexico”, “Young Blood”, “Searchin'”, “Yakety Yak”, “Charlie Brown”, “Along Came Jones”, “Poison Ivy”, “Little Egypt”. Impossible a task it is, but house rules say I have to pick just one for our SoTW. Should it be the first, “Riot in Cell Block #9“, the manic genius anarchical jailhouse opera production? The paean to STD “Poison Ivy” with the greatest couplet in rock annals, “You’re gonna need an ocean/of calamine lotion”? No, let’s just go with the greatest of the great, the anthem of all the sullen, acned, lethargic adolescents we all were–”Yakety Yak“. Written just for me and ‘all my hoodlum friends outside’. Leiber and Stoller’s career didn’t end there. They hundreds and hundreds of memorable hits (‘On Broadway’, ‘Under the Boardwalk’, ‘Stand By Me’, ‘Spanish Harlem’, ‘Chapel of Love’, ‘Leader of the Pack’, ‘Ruby Baby’, ‘She Cried’, ‘Only in America’, ‘Is That All There Is?’, 20 songs by Elvis, many if not most of The Beatles first recordings), and still write on occasion. One reader told me that I was focusing too much on singers with morbid, sensationalist, Yellow Journalism sob story bios – Blind Willie Johnson, Eva Cassidy, Radke Toneff. 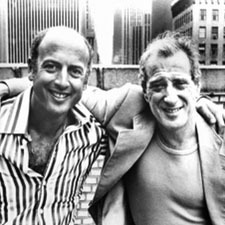 Well, no one’s going to make an afternoon TV movie about Leiber and Stoller. But someone did make a very successful Broadway show. In 1995, Smokey Joe’s Cafe: The Songs of Leiber & Stoller opened on Broadway – forty songs by L&S, running for over five years, the longest-running musical revue in Broadway history. What’s the coolest song you know? I’m talking profoundly cool, street-smart, zoot suit, cigarette hanging out of the mouth, fedora rakishly tipped over the brow, dark shades keeping that ol’ world outside outside. I’m talking so cool that there ain’t a need in the world gonna get you to work up a sweat. Not a wad of bills, not a plate of ribs, not even a loveseat full of your sweetie. 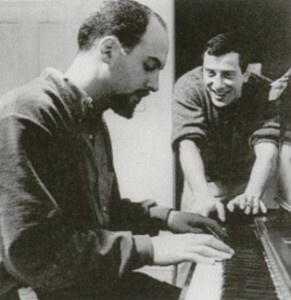 In 1952, Jerry Leiber and Mike Stoller were two 19-year old Jewish boys trying to write black songs for the black audience in LA. Their first song to hit the charts was Charles Brown’s ‘Hard Times’, which hit #8 on the R&B charts (there were segregated hit charts in those days, Virginia). Not bad, but not enough to put kosher grits on the table. They set out to write a geographically specific but musically traditional blues for Little Willie Littlefield. 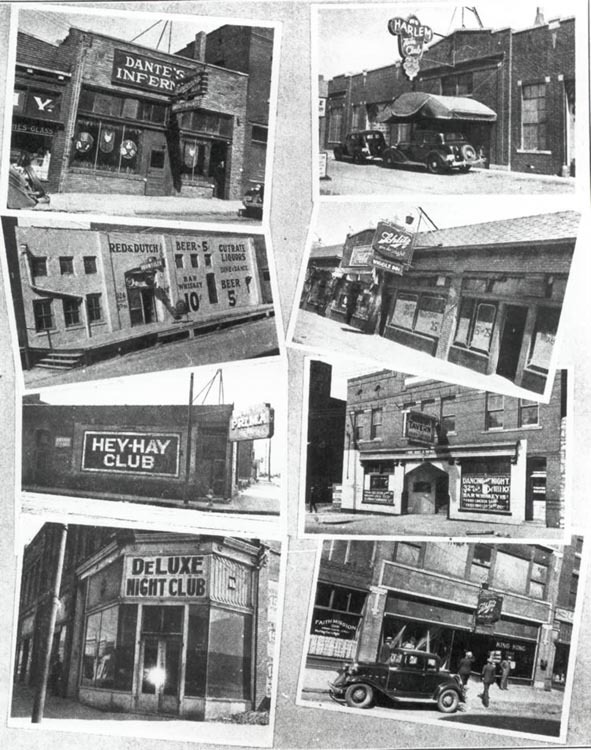 Believe it or not, for LA circa 1952, Kansas City, with its bars and bordellos (not to mention Count Basie and Charlie Parker) was the epicenter of cool. Little Willie (b. 1931) was a teenage wonder in LA, bridging boogie-woogie and R&B and even rock and roll, with his 1949 his ‘It’s Midnight’ popularizing the right-hand triplets which would inspire pianists such as Fats Domino. 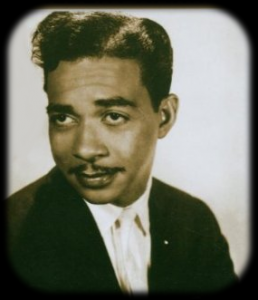 For 50 years he toured the chitlin circuit and played clubs in the San Francisco area. In 2000 he took a 5-year break to fish in Holland (“I know every herring in Holland by name”), but then went back to the ivories. Going to Kansas City, Kansas City here I come. They got a crazy way of loving there and I’m gonna get me some. With my Kansas City baby and my bottle of Kansas City wine. I’m gonna pack my troubles, leave at the crack of dawn. My old lady will be sleeping and she won’t know where I’ve gone. But if I have to walk, I’m going just the same. The third verse was quickly dropped, and ‘crazy way of loving’ became ‘some crazy little women’. Oh, yeah! The hip melody stayed, the title got jazzed up to “K.C. Lovin’”. They taught the song to Little Willie, and it went nowhere. 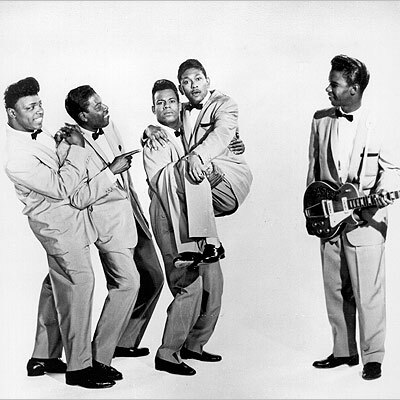 They were a bit more successful with ‘Hound Dog’ for Big Mama Thornton (1953), ‘Love Me’ for Willy & Ruth (1954), and ‘Ruby Baby’ for the unknown young Drifters (1956), but only in ‘the race market’. The big money was of course in the suburbs, where the white kids were just starting to dabble in that black music. These early flops soon became a gold mine: Elvis’ ‘Hound Dog’ and ‘Love Me’ (1956), and Dion’s ‘Ruby Baby’ (1963). 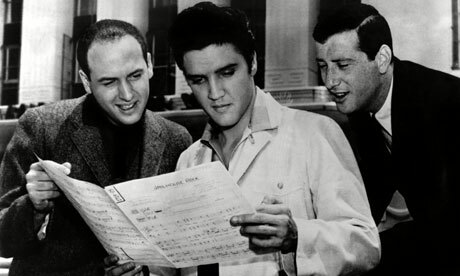 It wouldn’t be long before they began their string of hits made directly for the pop chart without the detour into authenticity: ‘Searchin’ and ‘Young Blood’ for the Coasters and ‘Jailhouse Rock’ for Elvis (1956-7). We had the pleasure of walking through Leiber and Stoller’s brilliant career of songwriting and producing back in SoTW 042, with The Coasters’ great ‘Yakety Yak’. And then in 1959, at the height of their creative powers and commercial success (4 songs in the Top 10), what should resurface but a remake of Little Willie’s song by Wilbert Harrison (b. 1929)? A Harlem entrepreneur named Bobby Robinson spent $40 on a recording session for the obscure sometimes-bluesman, sometimes calypsomon pianist-vocalist Wilbert, with Wild Jimmy Spruill backing him on guitar. Wilbert pretty much copied Little Willie’s reading of the tune, and it went to #1 on both the Pop and R&B charts. Wilbert had a minor hit in 1969 with his own ‘Let’s Work Together’, which was later a hit for Canned Heat, and later as ‘Let’s Stick Together’ for Bryan Ferry. So I guess we could call Wilbert a ‘One-and-a-half Hit Wonder’, and there the story ends. 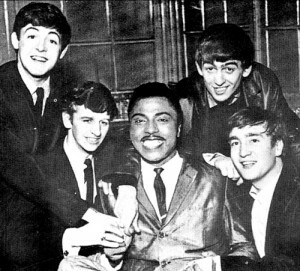 In November, 1955, Little Richard recorded ‘Kansas City’ twice. Take 1 (released only in 1970) rather followed Little Willie’s reading of the song, albeit speeded up and Little Richardized to a restrained degree. Take 2 was all Mr Penniman, complete with hey-hey-hey’s and call-and-response backing vocals. It reached only #95 in the US, but a respectable #26 in the UK. This version just might ring a few familiar bells for many of you. Then in 1956, the right Reverend Penniman recorded ‘Hey-Hey-Hey-Hey’, basically an amplification of his (second) treatment of ‘Kansas City’. Young John and Paul picked up the Little Richard version, married it with his ‘Hey-Hey’, and gave The Beatles one of their most highly-charged early covers (here’s their version from 1962, Hamburg). Check out this video from the very height of Beatlemania (Shindig, 1964) singing ‘Kansas City / Hey-Hey-Hey!’ live, with Beatle Paul at his very cutest. But if it’s bombast and wrinkles you need, here’s Sir Paul employing ‘Kansas City / Hey-Hey-Hey!’ as an encore in 1997 with a little help from his friends Phil Collins, Carl Perkins, Mark Knopfler, Sting, Elton John, and Eric Clapton. The song’s been covered literally hundreds of times, by everyone from Jimmie Witherspoon and Little Milton to Ann-Margret and Pat Boone. We were talking about cool. About not needin’ nuttin’. Well, Wilbert’s treatment is about as self-sufficient as anything I can think of. Oh, yeah, there’s this big, burning need to get back to his KC lover. He might take a train or a plane, but if he has to, he’ll walk all the way to Kansas City. The only problem is that that Wibert’s song’s really a very cool shuffle; and at that rate, it’s going to take him a very long time to get there. Well, no hurry. Wilbert’s not running anywhere. Heck, Leiber and Stoller never made it there till 34 years after they wrote the song. Not even one from Kansas City.